Heralded as the new breakout film of 2012, both for its director and its child starlet, Beasts boasts characters, acting, location and a plot that can only exist where they do, and I would almost even go as far as describing it as a rare example of a seemingly dichotomous fantasy-cinéma-vérité-drama genre. I would say this is a pioneer in this new genre, but I can’t help but draw parallels to both Pedro González-Rubio’s 2009’s Alamar and (to a much lesser extent) to Pier Paolo Pasolini’s work, especially with his use of non-professional actors coming from the region where the film is set. In fact, Dwight Henry, in the role of Wink, hails from Louisiana and claims he has been “in neck-high water” during Katrina, which gave him a unique “inside understanding for what this movie is about”. Other than the historically inaccurate Aurochs (Zeitlin used baby potbellied pigs that he dressed up with fur and horns, for practical and budgetary reasons), the film’s main weakness is the plot, which despite being captivating and beautifully filmed, is rather thin, relying primarily on the interaction between the heroine and her father with their environment and nature. Fittingly, the film’s only real brush with reality is the devastating plan involving the levee, which leads to the brief but chilling encounter with “real life” and the harsh consequences that it entails when compared with the idyllic and carefree life presented at the beginning (and the end). Ultimately, the film acts as a documentary in the sense that it presents the smooth flow of life and nature in the dream-like Bathtub, and any attempt to pry its inhabitants from this community, effectively waking them up from the dream, does not end well. 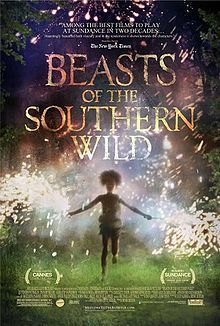 The ending is thankfully left somewhat ambiguous and open to us, but not without making it clear that Hushpuppy has grown in the course of the movie (thus fulfilling the classical dramatic arc and in a way conforming to the narrative structure Hollywood likes so much). This is not to say that it is not enjoyable and a great work to experience, especially considering it is the director’s first feature. I am curious to see what his next project will be, as he has already set relatively high standards of excellence for himself, especially considering this first film is also his first Oscar nomination. Overall great, well deserving of the nomination.